Which majors are popular for Hispanics around the country and what are their respective annual earnings? Majors are not perfectly aligned with occupations, but they do determine lifetime earnings. Today a college education is the gateway to the middle class. Hispanics who have not had access to economic resources over generations receive the most benefit from earning a Bachelor’s degree as their lifetime earnings increases. View median earnings for college majors nationally. This interactive web tool allows you to see how much college graduates earn by 15 major groups and 137 detailed major subgroups nationally and within states. October 2015, Hispanics: College Majors and Earnings provides information on the national breakdown of Hispanics by majors. Which majors are the most popular for Hispanics? Which majors pay the most and the least? Learn what is the rate of completion for Hispanics in the fields of study of Business, Health, Education, and other undergraduate majors. 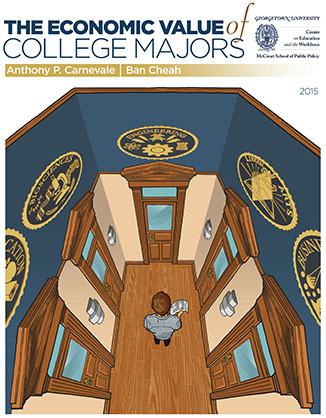 May 2015, The Economic Value of College Majors uses Census Data to analyze wages for 137 college majors to detail the most popular college majors, the majors that are most likely to lead to an advanced degree, and the economic benefit of earning an advanced degree by undergraduate major. This report contains more information on Hispanics and features an interactive web search tool. May 2011, What’s It Worth? The Economic Value of College Majors details the relationships between major, gender, race/ethnicity, attending graduate school, and annual earnings. Understand the differences in majors and pay. This report contains national data only. "We've known for a while that your major has a large effect on your ability to get a job and work your way up a career ladder."